ANAHEIM , Calif. , May 5, 2004 Premiering on May 5, 2005 with the Disneyland 50th anniversary The Happiest Homecoming on Earth celebration, the all-new Walt Disneys Parade of Dreams will highlight the many classic Disney stories and characters that have contributed to the magic of Disneyland over the past five decades. Planned for two performances each day during the 18-month long golden anniversary festivities, Walt Disneys Parade of Dreams is sure to delight audiences of all ages. 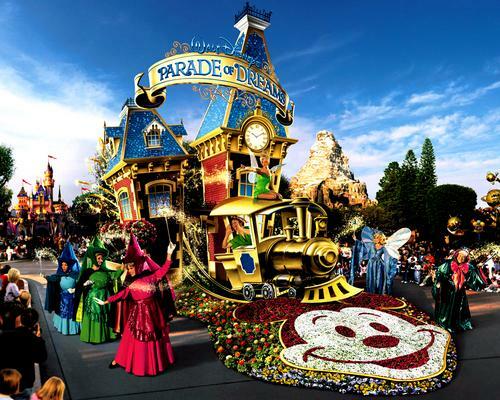 Combining heart-warming Disney moments and beloved characters with visually stunning floats, timeless tunes and energetic performers, the parade (designed especially for the golden anniversary celebration) will be unlike any previous Disneyland parade spectacular, in scope and presentation. The parade will be a grand procession and performance that will thrill, engage and amaze our audience, said Anne Hamburger, executive vice president, Disney Creative Entertainment. We have pulled out all the stops to include one of the largest gatherings of Disney Characters ever, plus fantastic dancers, rhythmic gymnasts, trampoline performers and aerial artists whose talents will take this parade to a whole new levelliterally. Our Parade of Dreams will be a wholly unique, entertaining and truly theatrical presentation, said Steven Davison, creative director, Disney Creative Entertainment. We have four performance stops along the parade route that will dazzle audiences with unbelievable musical production numbers presented by over 100 performers. Raul Rodriguez, famed float designer for the world famous Pasadena Tournament of Roses Parade, served as a key production designer in the creation of Walt Disneys Parade of Dreams. The parade floats will act as rolling stages, featuring not only distinctive design but such whimsical elements as jumping fountains, confetti blasts, wafting bubbles and elaborate puppetry. Some of the float units will reach heights of nearly 20 feet. Gateway to Dreams Everyones favorite pixie, Tinker Bell, will Welcome everyone and lead off the impressive procession with a generous sprinkling of pixie dust from her perch atop a shimmering golden locomotive. Tinker Bell will be joined by a host of Disney magic makers, including Cinderellas Fairy Godmother, Pinocchios Blue Fairy, Sleeping Beautys Flora, Fauna and Merryweather and little King Arthurs Merlin the Wizard. Dream of Enchantment The enchanted characters from Disneys Beauty and the Beast invite everyone to Be our Guest, as dancing silverware, salt and pepper shakers and a flirtatious feather duster join Belle, Beast, Lumiere, Cogsworth and Mrs. Potts in a show-stopping musical spectacle. Dream of Laughter Geppettos workshop comes to life in a fantastical display of toys and life-sized marionettes that astonish the audience with their breathtaking antics utilizing elasticized shock chords, choreographed to the appropriate tunes of Ive Got No Strings and Hi-Diddle-Dee-Dee (An Actors Life for Me). Pinocchio joins the world of wind-up toys along with Jiminy Cricket and Cleo. Dream of Another World Taking guests to the charming ocean kingdom of The Little Mermaid, Sebastian the Crab contributes his famous Caribbean flair. Ariel and Flounder float nearby to the tune of Under the Sea, complete with bubbles, dancing fish and leaping fountains. Rhythmic gymnasts perform with pearl balls while the evil sea witch Ursula, a giant articulated puppet, lurks in the background. Dream of Imagination Mr. White Rabbit, the Queen of Hearts and all of the whimsical and wonderful characters from Walt Disneys Alice in Wonderland happily celebrate A Very Merry Unbirthday at the Mad Hatters Tea Party. Tweedle Dee and Dum chase the White Rabbit down the parade route while a pair of wild cards bounces atop the trampoline tea table. Meanwhile, the Caterpillar puffs smoke rings into the air as performing flowers bloom with the use of bounce stilts. Dream of Adventure This gathering atop Pride Rock utilizes amazing puppetry to portray a the regal couple of Simba and Nala, while all the creatures from the Pride Lands (represented by live performers, puppets and kites) join in the Circle of Life celebration, along with Rafiki, Pumbaa and Timon. A rising tree features two twirling acrobatic dancers performing as exotic birds. Dreams Come True The finale float representing the majesty of Sleeping Beauty Castle provides an incredible backdrop for Disney Princesses and their Princes, along with regally-dressed Mickey and Minnie and an array of favorite Disney characters. A Dream is a Wish Your Heart Makes (from Walt Disneys animated feature Cinderella) and When You Wish Upon a Star (from Walt Disneys animated feature Pinocchio) bring the parade to a happily ever after conclusion.